Two days after being asked to join Stephen Colbert’s late night house band Stay Human, saxophonist Grace Kelly found herself onstage in front of a national audience playing the clarinet, an instrument she hadn’t touched since fourth grade. “The other day before we went on stage, Jon [Batiste, Stay Human’s band leader] taught us four new songs. People might not realize that but sometimes we don’t even have a set list and Jon’s just making up stuff on the spot,” Kelly told NBC News. Kelly, a 23-year-old self-proclaimed “Broadway nerd,” first fell in love with the saxophone at age 10 after years of wildly singing Stan Getz’ sax solos around her house. She released her first album at 12 and and currently has 10 albums to her name — the last titled “Trying To Figure It Out,” released Feb. 19. Kelly, who was born and raised in Massachusetts, has headlined more than 700 shows in 30 countries, and counts musical greats such as Frank Morgan, Wynton Marsalis, Huey Lewis, and Lee Konitz among her list of mentors and past collaborators. "...the fact that playing saxophone and being female is just unusual. It’s still such a boy’s club." She’s a seven-time winner of the Downbeat Critic’s Poll “Rising Star” and, since graduating from Berklee School of Music at age 19, Kelly has been praised for her innovative approaches to jazz, mixing her sounds with pop, soul, rock, and Broadway influences. So how did the Billboard-titled “jazz innovator” land a spot in late night's most talked about band? It involves Questlove, Jon Batiste, and of course, a random jam session in New York City. “There are a lot of pinch me moments [such as] working with someone like Jon Batiste. The first time I sat in with Jon and just jammed was at an invite party somewhere in New York. Then Questlove just started playing with us,” she recalled. “I was like, 'What is happening?!'" Batiste, considered to be one of the most innovative jazz musicians under 30, soon began calling Kelly for one-off gigs before asking her to join Stay Human on “The Late Show With Stephen Colbert” last December. It was her affinity for improvisation and her musical chemistry with Stay Human’s lead saxophone player Eddie Barbash that made her the perfect fit for the group. Outside of her “Late Show” job, Kelly continues to pursue her own music. This year, she’ll appear as herself in Amazon’s “Bosch,” which will include music she wrote for the show. 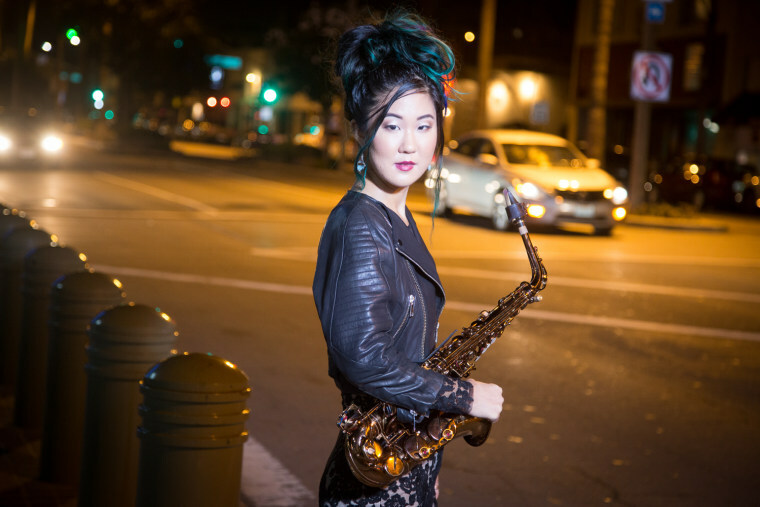 She adds that she sees her job as not only to touch people with music, but to make jazz accessible for other young Asian-American female musicians. “I feel sometimes like a mutt because my name is Grace Kelly — which is my real name. When people hear my name and aren’t looking at me, there is always that surprise factor. Then the fact that playing saxophone and being female is just unusual. It’s still such a boy’s club,” Kelly said. When asked how she continues to staying confident in being the “mutt” of jazz, Kelly explained it was two things. “Lee Konitz, Phil Woods, Wyton Marsalis — them really embracing me and saying, ‘Hey, come up on stage and play with us!’ Or ‘Let’s do a recording together,’ and not pointing out, ‘Oh she’s a cute girl,’ but really musically pushing me and making me feel like they don’t do that for every one," she said. "Then, just trying to embrace my differences and have that be something people can look up to. Being female in jazz, yes, there are less of us, but it also makes us a little more special because we’re carving pathways for other girls and we’re not just every other dude." Correction: An earlier version of this story misstated the names of Jon Batiste, Phil Woods, and Lee Konitz. Correction: An earlier version of this story stated that Kelly graduated from Berklee School of Music at 20. She graduated at 19.